This is a police procedural with a good pace and engaging plot. The story opens with a young girl murdered in her house while her twin sister swims in the family pool; their father, an attorney who has made his share of enemies, is found knocked unconscious upstairs. The writing is solid and the storytelling is smooth with nicely timed, unpredictable twists, so I found myself looking forward to reading the next little bit each night. I found the characters to be particularly well-developed for a book of this genre; oftentimes character development is set aside for the sake of keeping the plot at a breakneck pace, but Casey balanced both character development and pacing well in The Last Girl. 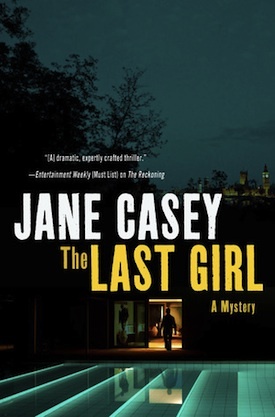 As I said, this is my first in the Maeve Kerrigan series, so perhaps I was not as invested in the detectives and their backstories as I would have been otherwise, but the book still worked for me, and I’d recommend it to anyone who likes detective stories, police procedurals, whodunits, and the like. And I do look forward to reading more by Casey.